Karl Marx likened capitalism to a vampire which lives and expands by sucking “living labour” from the worker by extracting “surplus value”, “unpaid labour”. But that is while the worker lives. Now we learn through Michael Moore, the US radical film-maker, that the biggest vampire, Wal-Mart – “a company with revenue larger than any other in the world” – actually bets on its “workers dying. “It takes out life insurance policies on its 350,000 shopfloor workers without their knowledge and approval” [Chris McGreal, The Guardian, 30 January 2010]. Moreover: “When one of them dies, Wal-Mart claims on the policy. Not a cent of the payout, which sometimes runs to $1 million or more goes to the family of the dead worker, often struggling with expensive funeral bills. This and many other devastating and shocking facts are revealed by Michael Moore in his latest film ‘Capitalism: A Love Story’. Socialists should repeat the facts and incidents outlined in this film and shout them from the rooftops. The anti-banker rage which is developing into a mass anti-capitalist consciousness will be boosted by this. We also discover from Moore that “Wal-Mart is not alone.” He talked to one unfortunate woman whose husband died of brain cancer in 2008. He worked at a bank until they fired him because he was sick. But the bank retained a life insurance policy on this man and cashed it in for $4.7 million when he died. When this was revealed to a cinema audience in Washington, “there were gasps”. Another family found themselves chucked out of their home with the father- a gun owner and a Republican voter at that – stating that he could understand why “someone might want to shoot up a bank”. Many other shocking facts are outlined, including incidents which completely vindicate Moore’s efforts to show the rottenness of the US health system in his previous film ‘Sicko’. We learn, for instance, that a former vice-president of Sigma health insurance admitted on TV: “Everything Michael Moore said in Sicko was true, and we were afraid this film would be a tipping point.” This is a health executive for once “coming clean”, which is not typical of the “vampires” that infest the ‘health industry’ in the US, and which has defeated all attempts so far to create a publically funded and run healthcare system. But Moore does not leave it at that. At the end of this film he concludes: “Capitalism is an evil, and you cannot regulate evil.” Correct, shouts every worker who has lost his or her job, been forced from a house through no fault of their own but the greed of the banks, cannot pay fuel bills and eat at the same time. Moore even goes on to say: “You have to eliminate it and replace it with something that is good for all people.” Right again, Michael. Democratic rights – the right to strike, freedom of assembly, a free press – are vital. Moreover, historically all these rights have been achieved by the struggles of working-class people in the teeth of bitter opposition from the bosses and their political cronies. But Moore himself has shown that when economic power is concentrated, as it inevitably is in this system in the hands of a minority of bloodsucking capitalists, then ‘democracy’ is mostly on paper and nullified unless the working class organises against them. Capitalist democracy means you can say what you want, so long as the bosses decide. In the US and elsewhere, the bosses control the press, the TV, the main political parties and the Senate and Congress. The Supreme Court in the US has reinforced this recently by taking steps to enhance this power by lifting restrictions on how much big business – Wall Street – can now spend in elections. Moore states: “What I am asking for is a new economic order… I don’t know how to construct that, I am not an economist. Under capitalism – a society based upon the production of profit for the minority and not social need, the “common good” is a chimera. We, the socialists and labour movement, fight for the “common good” in resisting wage cuts, the destruction of hard-won services like health, education, etc. We support all reforms and improvements for working class people. But history – and particularly as it is unfolding now in the US and worldwide – attests to the fact that the “common good” will be attacked and undermined so long as capitalism exists. Tragically, Michael Moore in all his films – as devastating as they are as an indictment of this system – stubbornly refuses to draw this conclusion. In this sense he is perhaps no different at this stage to the majority of US citizens – including the majority of the working class. Yet through his films, he is in a strong position to call for a real alternative to the system he clearly detests. That is democratic socialism. Events – and mighty events at that – are preparing the ground to undermine his and others’ reluctance to draw the obvious conclusion that only democratic socialism and a powerful labour movement fighting for this can defend the common good, enhance and improve it. This will be at the expense of the power, income and prestige of the minority – the 1% that Michael Moore refers to. The statements and ideas of Moore reflected through his films indicate that although not yet recognised by him, socialism is on the march, even in the former bastion of capitalism. It is not excluded that such is the present hatred which is generated against the banks and the rich in the US that the country could be propelled into the first rank of movements towards socialism. If it does it can become the anvil upon which will be shaped the socialist future of humankind. 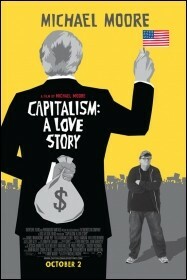 Michael Moore’s ‘Capitalism: A Love Story’ will be released on DVD in Australia on March 10. Public housing tenants get organised!